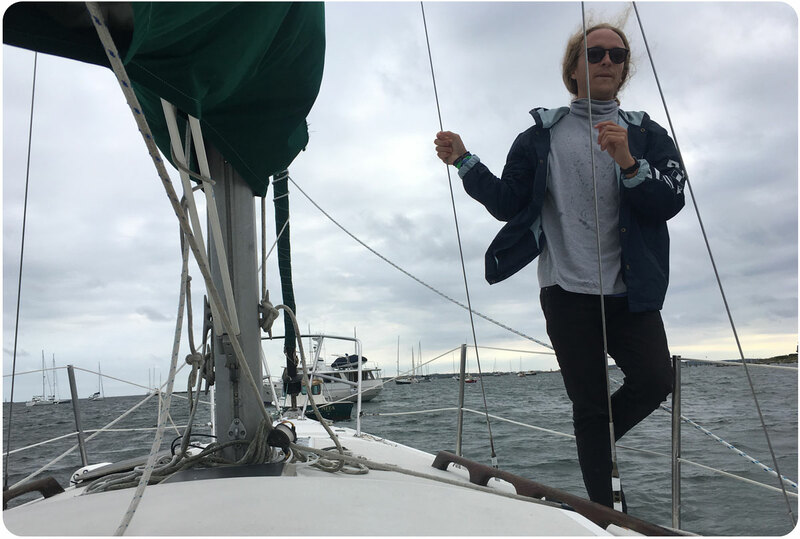 Stonington, 21 September 2018: On this windy Friday afternoon, Lucas invited the Baumann lab on a little sailing tour on board of his boat, which he also calls home. 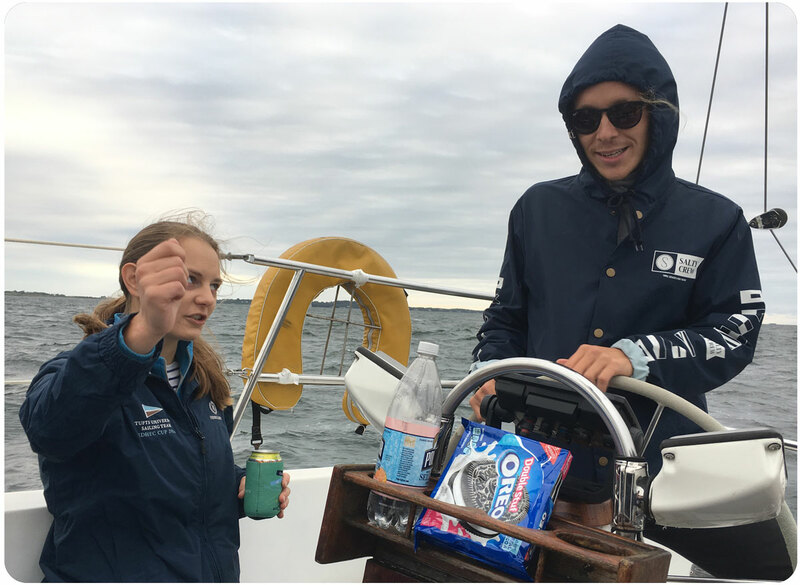 Thanks to the professional skipper qualities of Lucas and Julie, the rest of us had to just lean back and enjoy the sea and the wind and the company. Thanks to all! 23 Juli 2018. 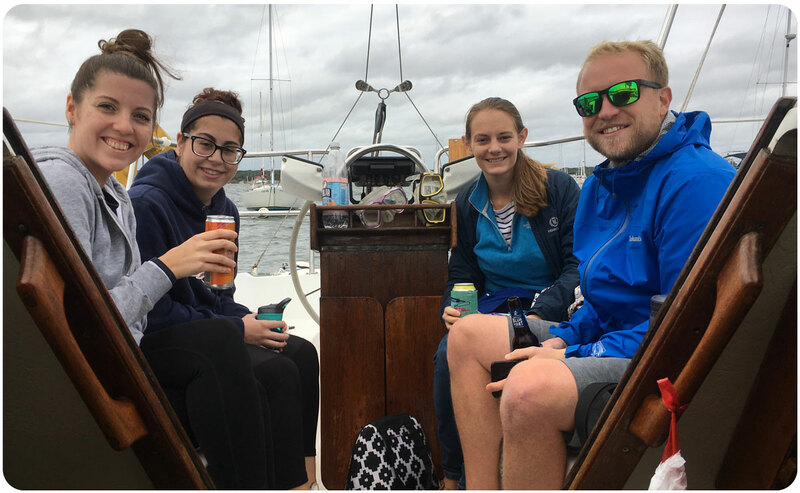 Yesterday Hannes and Emma took a short road trip to the University of Rhode Island to visit Professor Jacqueline Webb’s lab to learn about in vivo fluorescent imaging. 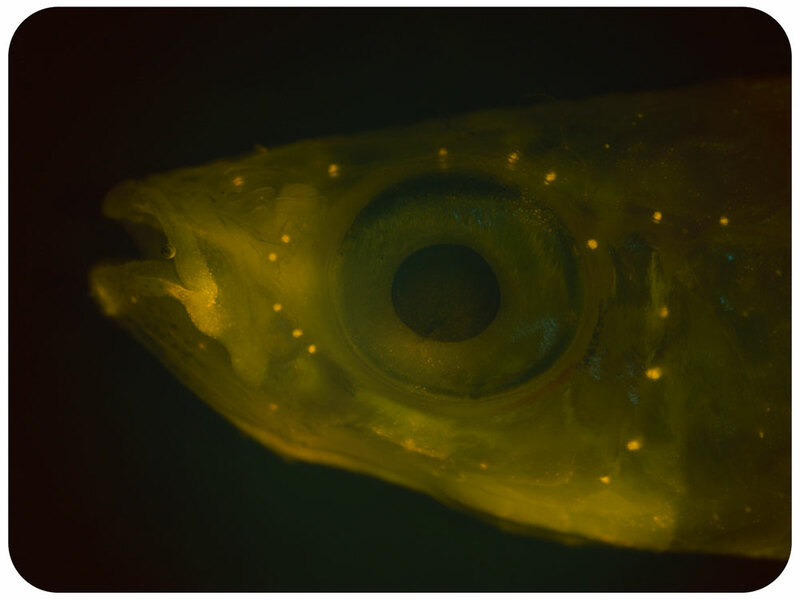 This technique involves placing live fish in a fluorescent mitrochondrial stain for 5 minutes before imaging different areas of the fish under a dissecting microscope equipped with an epiflourescence light source. 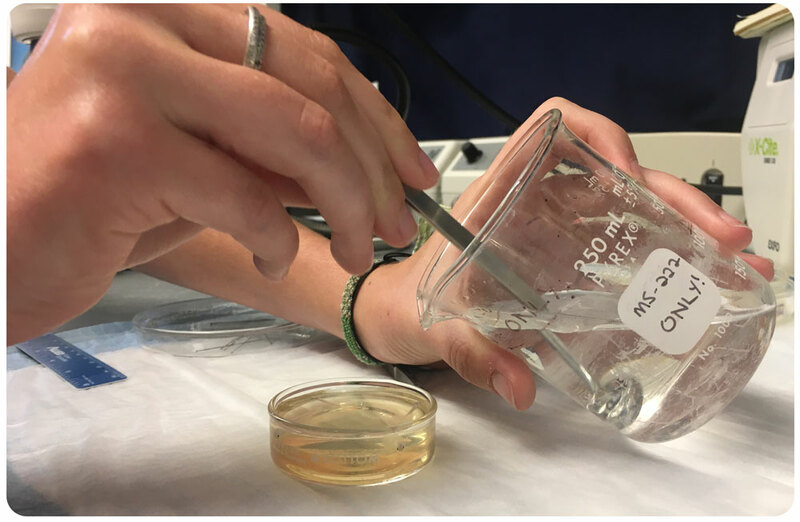 This allowed us to visualize small sense organs called neuromasts located in tubular canals in the head, trunk and tail, which form the fish sensory lateral line system used to detect water flows. 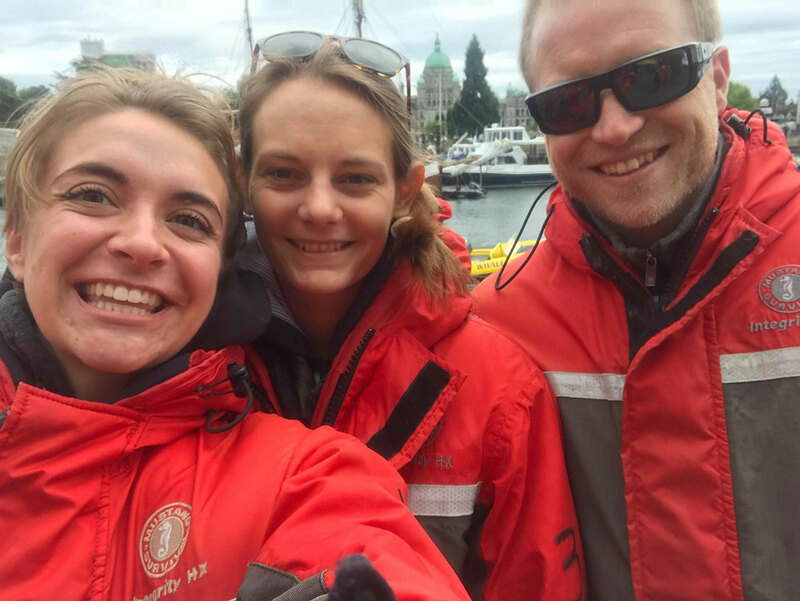 We are interested to see if high CO2 conditions affect these neuromasts in the Atlantic silverside, which could impact their critical schooling behaviors. 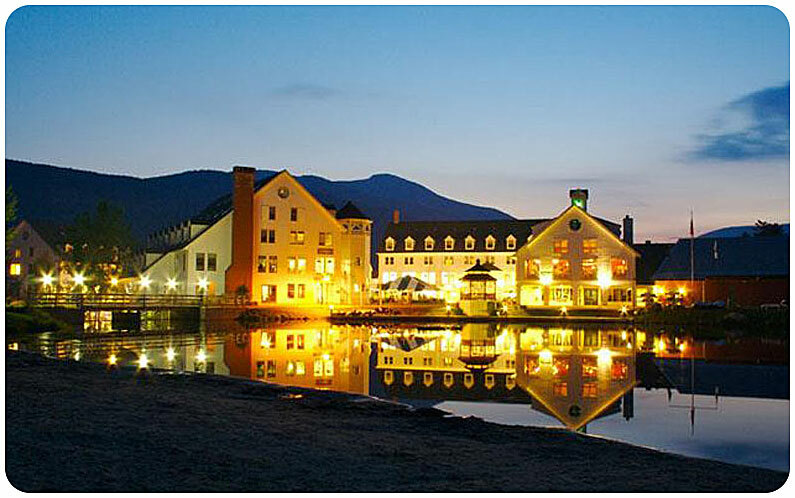 Take a look at some of the stunning images below! Thank you to Jackie and all the lab for a fun-filled day! 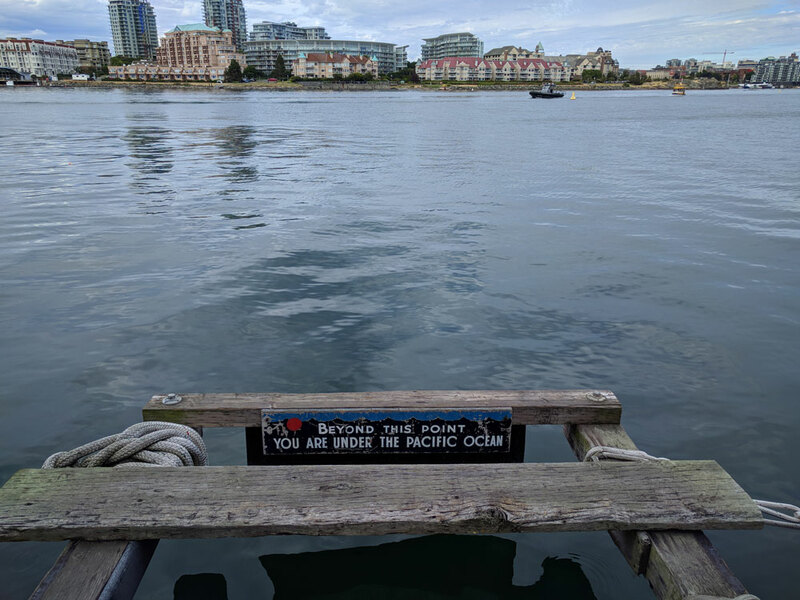 20 July 2018. 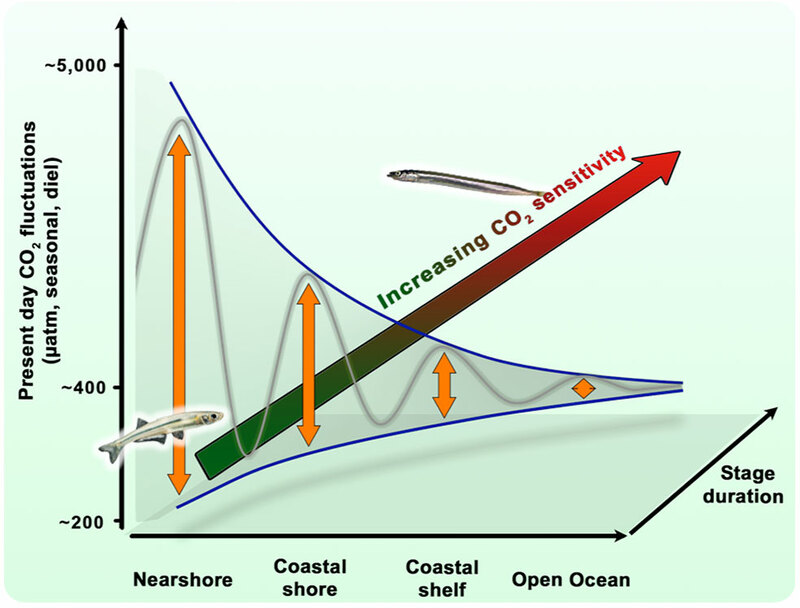 We are happy to announce that Diversity just published Chris Murray’s paper on complex CO2 x temperature effects in Atlantic silverside offspring. 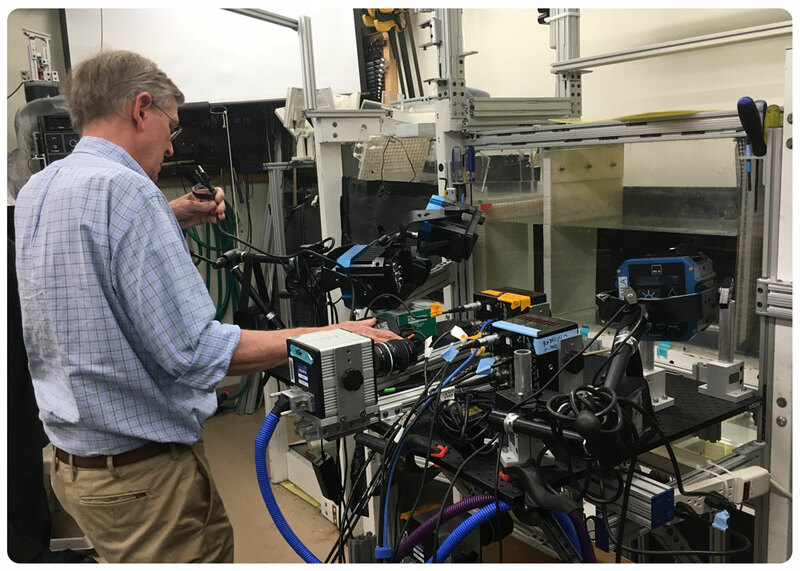 The paper synthesizes 5 large multistressor experiments conducted since 2014, finding evidence for the large CO2 tolerance in this species across a large temperature range. 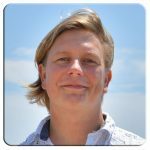 Congrats, Chris, to the second chapter published! M. menidia. 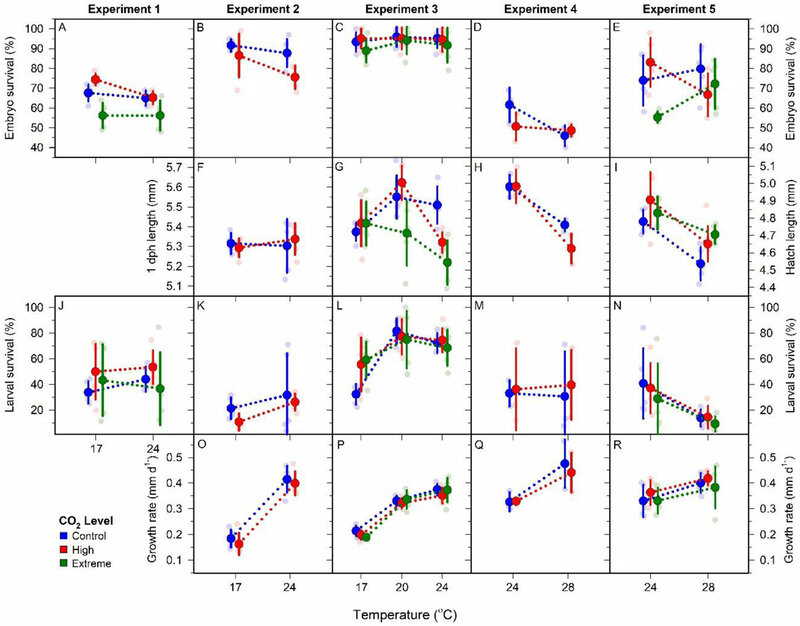 Offspring responses to control (blue), high (red), and extreme (green) CO2 conditions at four temperatures across five CO2 × temperature factorial experiments. Traits include embryo survival (A–E), hatch length (F–I), larval survival (J–N) and larval growth rate (O–R). Individual replicates are represented by small faded circles. Treatment means (±SD) are depicted by large, bold circles and connected by dotted lines. 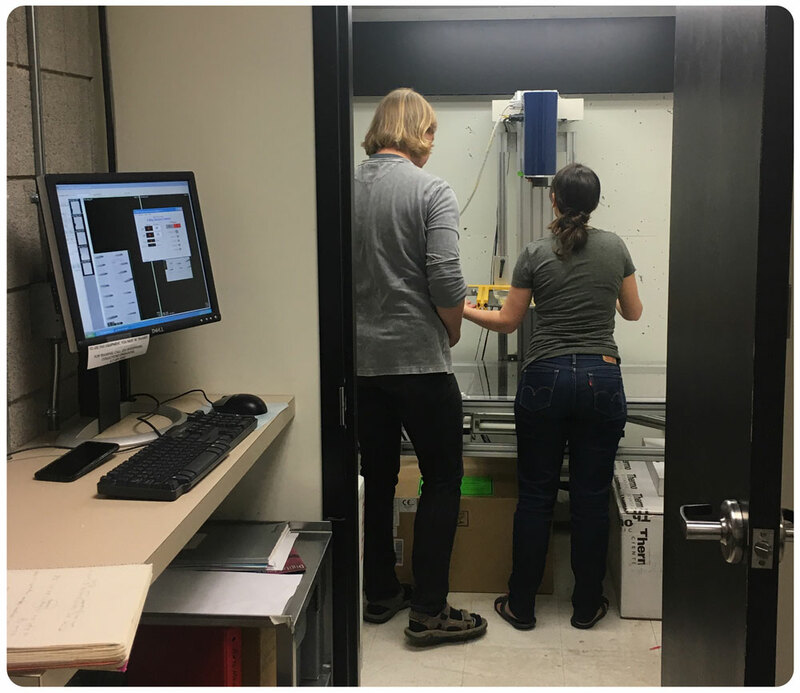 Note: different scales used for hatch length measurements due to differences in sample timing; panels F and G use 1dph length Y axis (left) while panels H and I use hatch length Y axis (right). 19 July 2018. 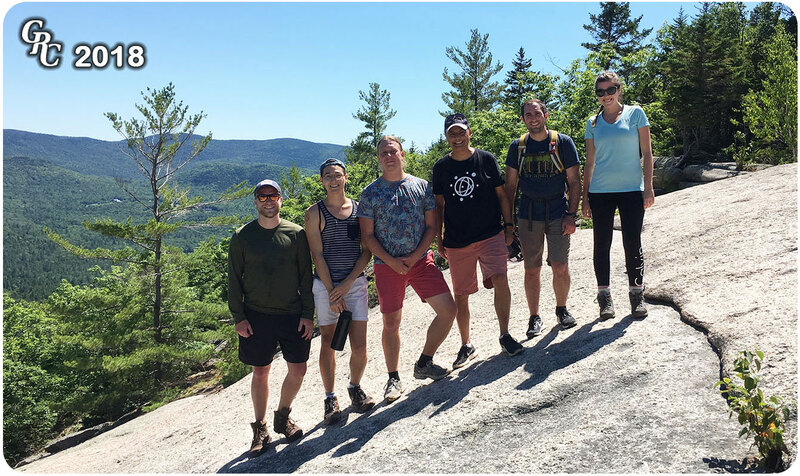 Members of the Baumann and Dam labs cherished the opportunity to participate in the Ocean Global Change Biology Gordon Research Conference in Waterville Valley, NH. 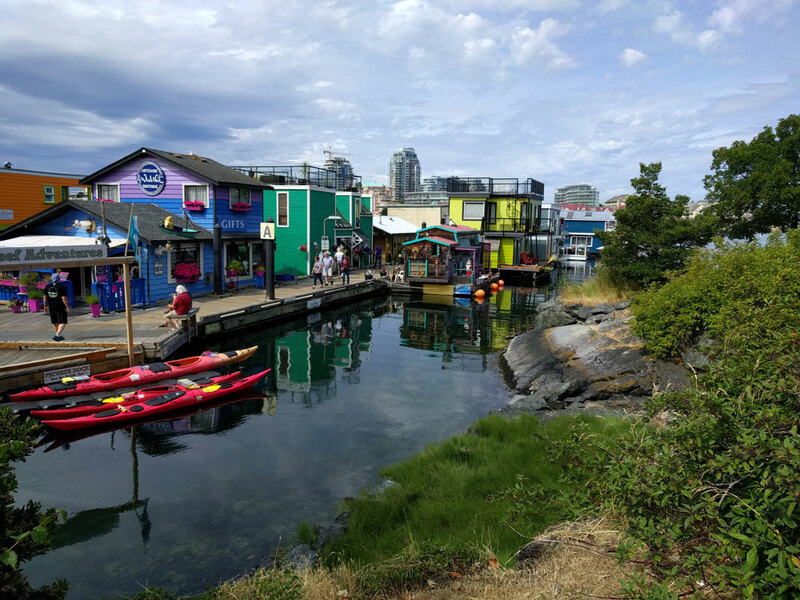 The particularly intimate format of the Gordon Research Conference was wonderfully conducive to listening to groundbreaking science in form of keynote lectures and posters and to network with colleagues from all over the world. 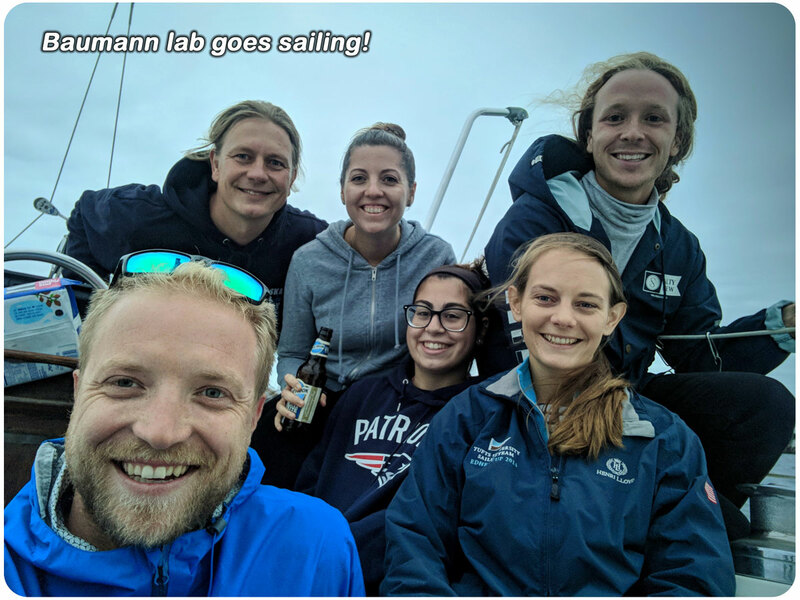 While Hannes gave a keynote lecture about experimental progress in assessing fish sensitivity to marine climate change, Chris, Emma, Jimmy and Hans presented their research all throughout the week during the poster sessions. 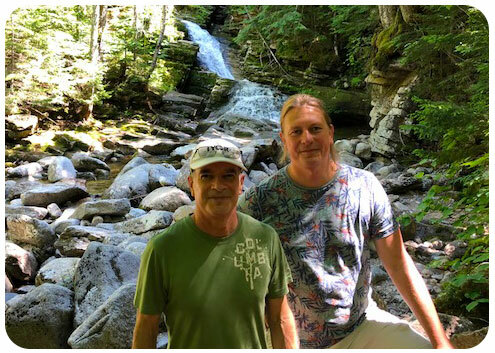 The beautiful setting of the conference in New Hampshire’s White Mountains and the relaxed atmosphere were all contributing to one of the most unique conference experiences all year. 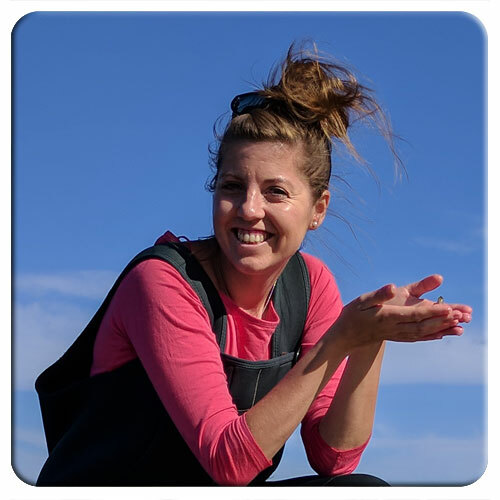 Baumann H. Using experiments to assess the sensitivity of fish to marine climate change: progress and knowledge gaps. Invited keynote talk. 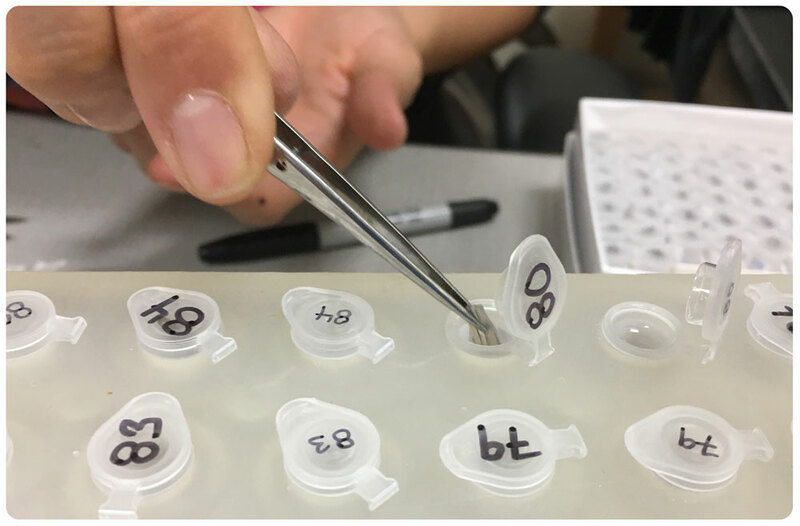 Murray, C.S., Wiley, D., and Baumann H. Sand lance offspring (Ammodytes dubius) show high sensitivity to combined climate stressors. Poster. 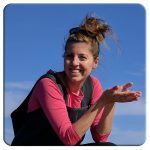 Cross, E.L., Peck, L., and Harper, E. Brachiopod resilience: thicker shells offset dissolution under future ocean acidification and warming. Poster. 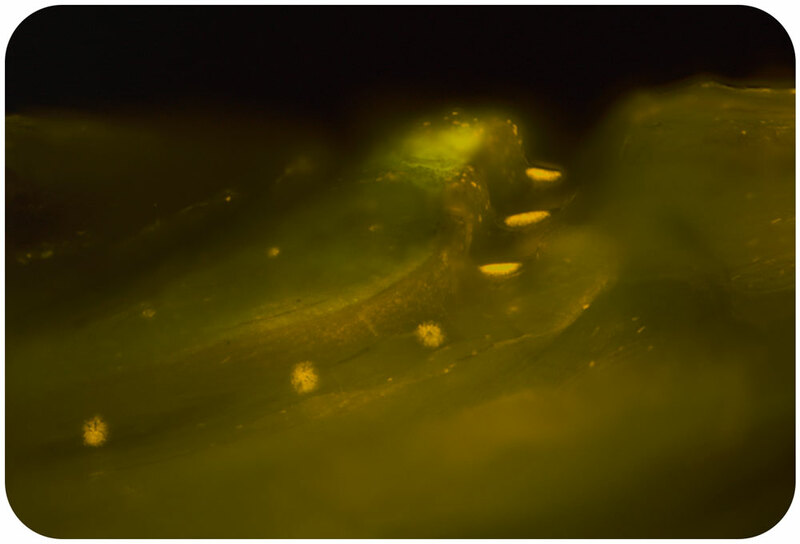 Dam, H.G., DeMayo, J.A., Park, G., He, X., Finiguerra, M., Baumann H., and Pespeni, M. Rapid adaptation of a marine copepod to a greenhouse world. Poster. DeMayo, J.A., Park, G., Norton, L., Finiguerra, M., Baumann H., and Dam, H.G. Costs of adaptation to a greenhouse world for the copepod, Acartia tonsa. Poster. Holding the fort at the Rankin lab were Emma and Sydney, who did an excellent job. Thank you guys! 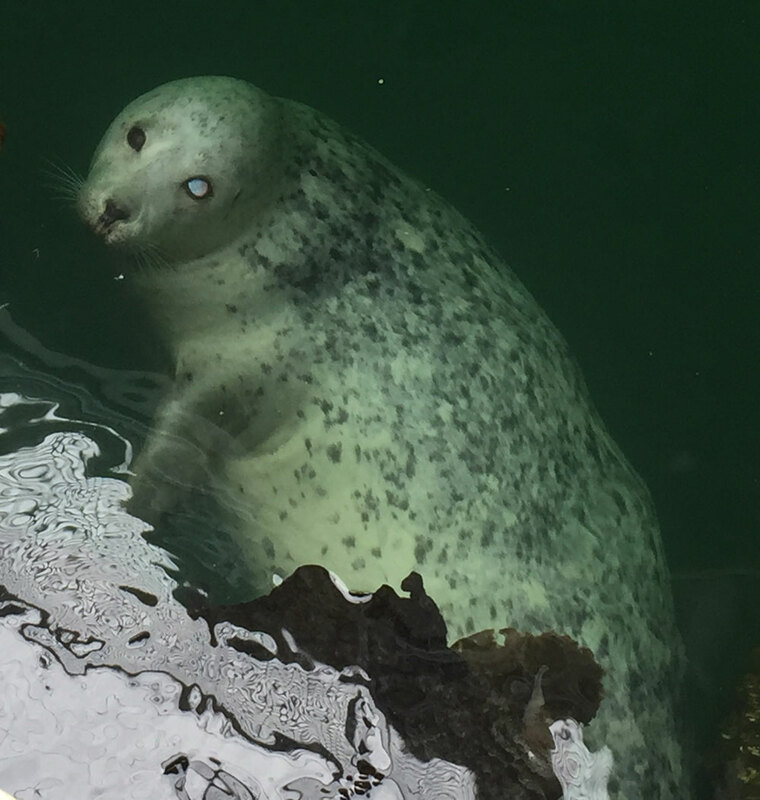 Ever since attending the American Fisheries Society conference in 2014, I’ve wanted to go to another fish-focused conference. 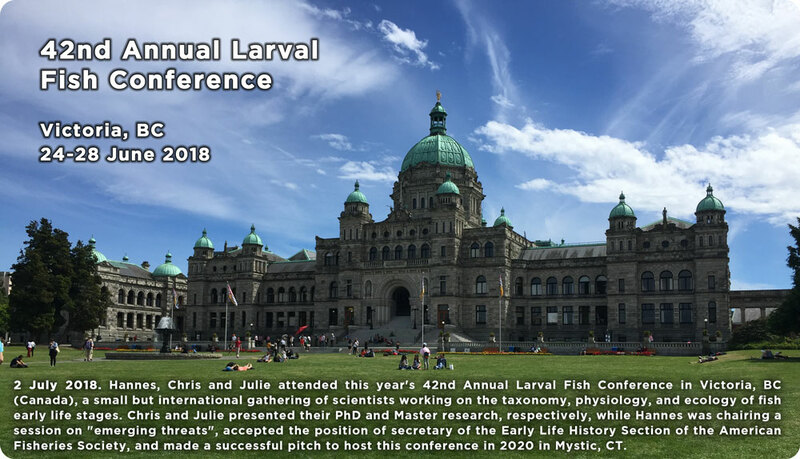 I was lucky enough to attend the 42nd annual Larval Fish Conference this year in Victoria, British Columbia, and it surpassed all my expectations. 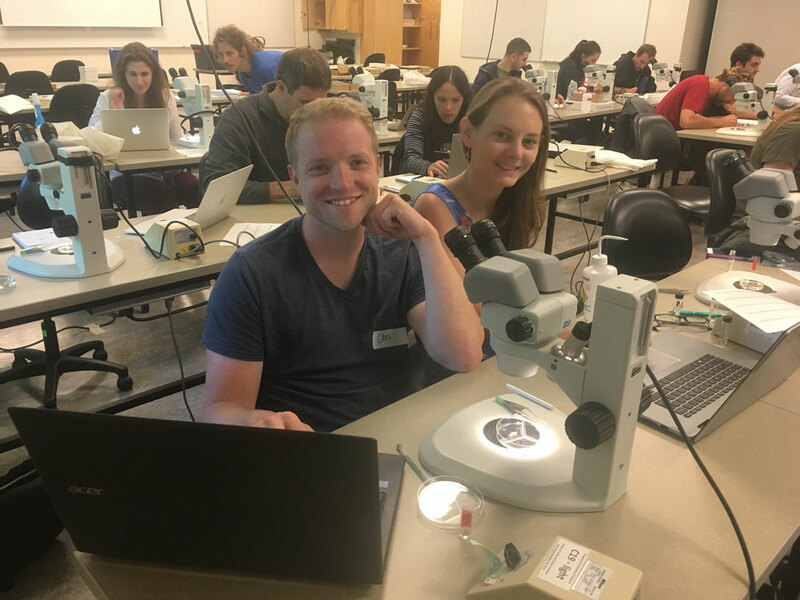 The week started off with a larval fish identification workshop where we got to learn techniques from renowned larval fish experts (and see some really cool fish larvae!). The talks were impressive and thought-provoking, providing many new ideas for research and how to give an engaging talk. 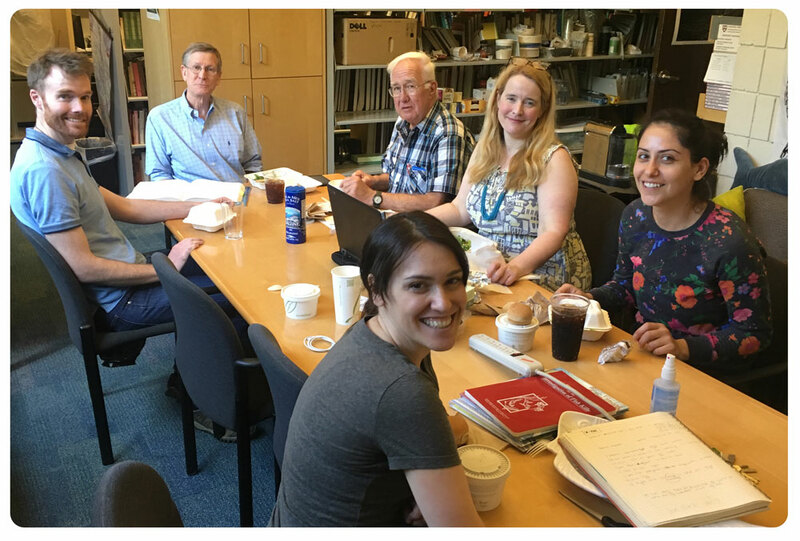 My favorite part was meeting all the larval fish ecologists whose publications I’ve been reading for my thesis. 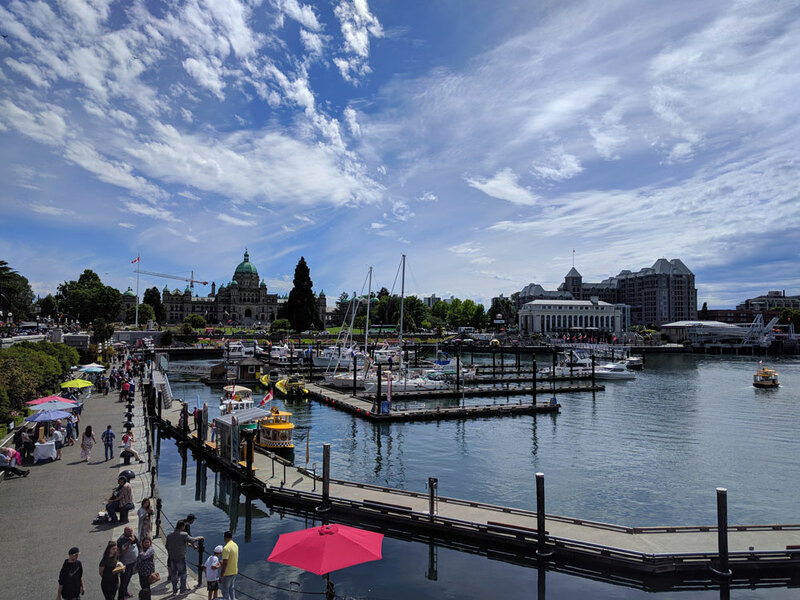 I spent most of my evenings exploring Victoria with other grad students attending the conference and left with many new friends from institutes all over the world! The trip ended with a whale watch, where we saw a pod of 5 Orcas. 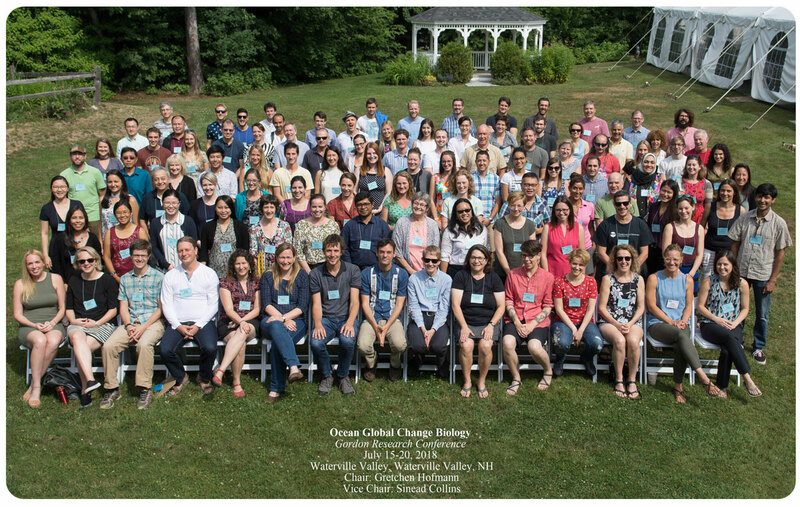 Overall, the Larval Fish Conference was a great experience that I hope to someday attend again! 29 June 2018. 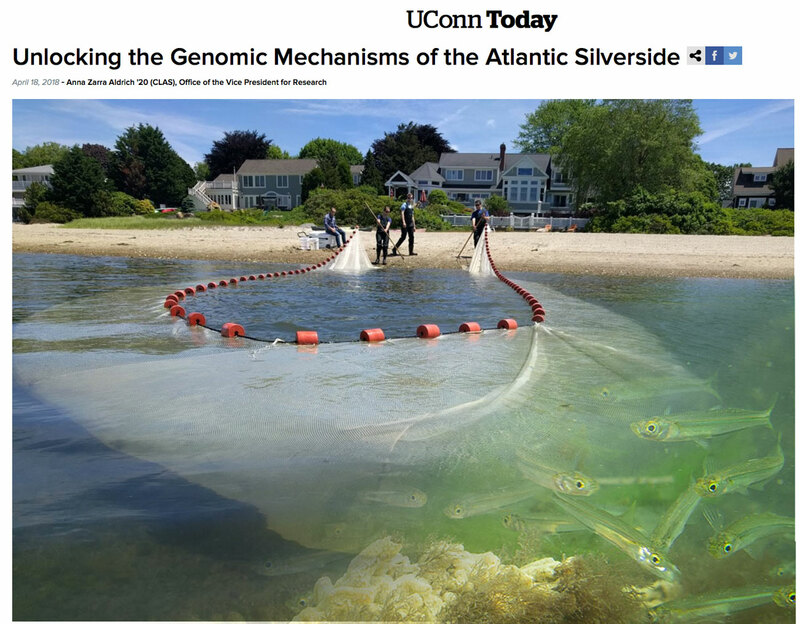 A new experiment with Atlantic silversides (Menidia menidia) starts and as usual, it’s an all hand on deck operation. This time, we have Chris Tsang shadowing all of us and Emma professionally explaining the process. 14 June 2018. 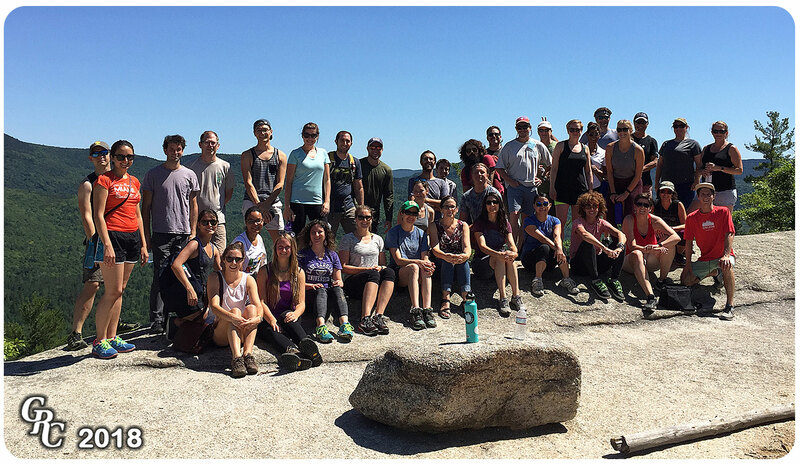 Members of the Baumann and Mason lab went on a trip to Mumford Cove, today, and Chris Tsang went along with his GoPro. 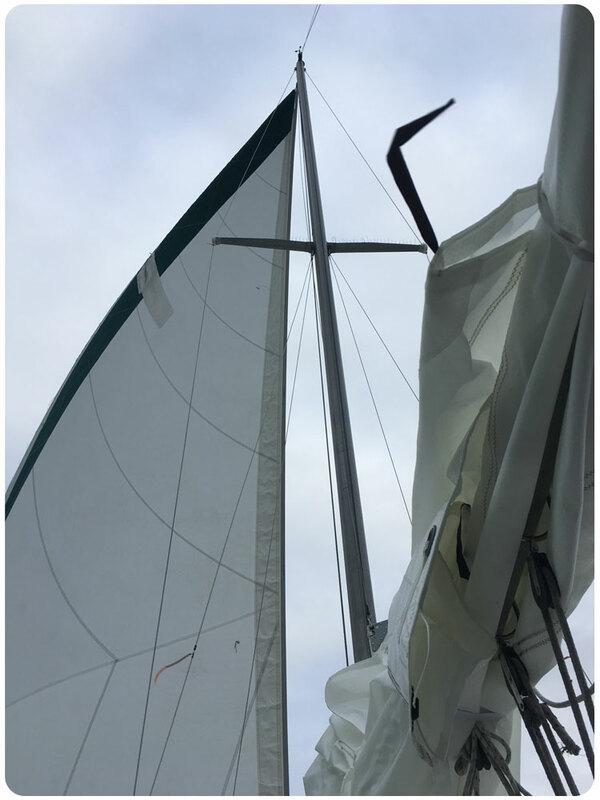 Thanks to Charlie, the skipper, the ride was smooth and a pleasure, a swapping our pH, Temperature, oxygen, and salinity sensor was successfully swapped with a new one recording for the next weeks in 30 minute intervals. 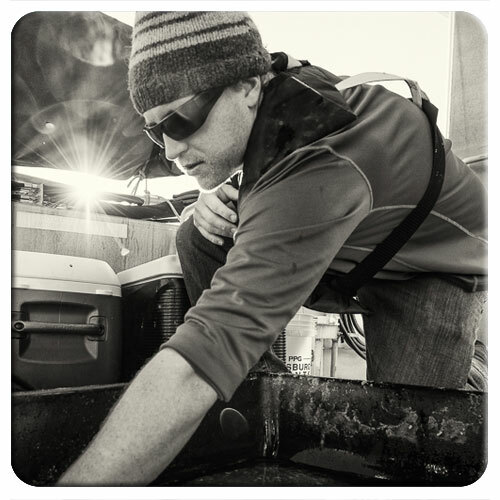 Wes Hoffman from the Mason lab, collected zooplankton with a Bongo-net. 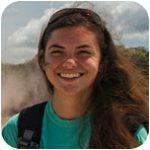 Sydney Stark, our NSF-REU student this summer, came along just for the fun. Friday, 8 June 2018. 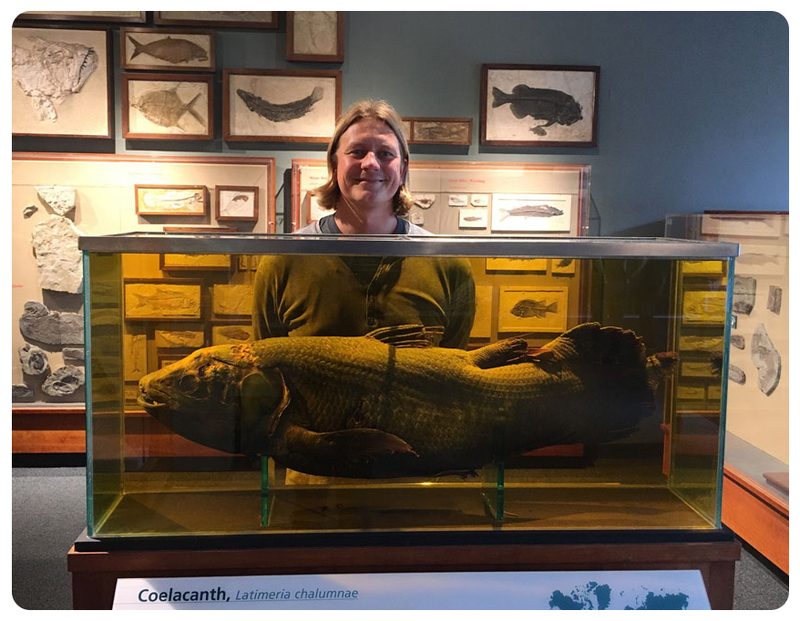 Hannes and Maria traveled to Boston’s Harvard University to meet with Valentina di Santo from the Lauder Lab at the Museum for Comparative Zoology. 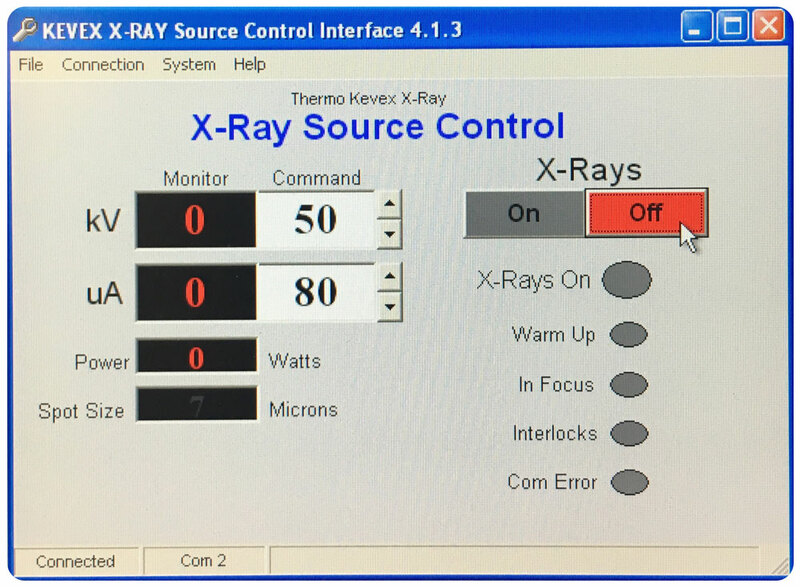 Thanks to our collaborators there, we were able to use a 2D-digital X-ray machine there, which we needed to complete the next big step in our Menidia Gene project. 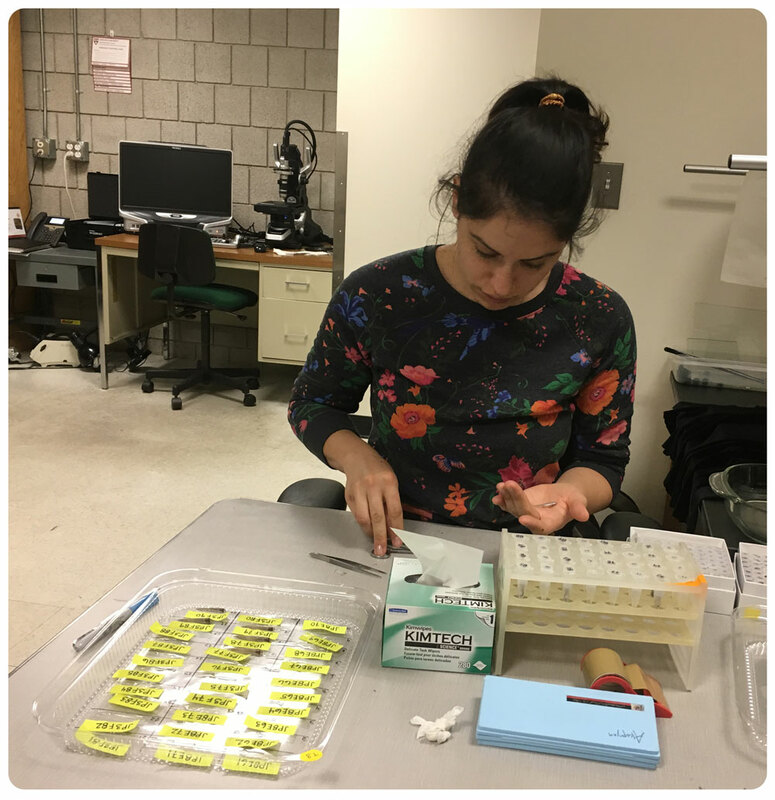 A few weeks ago, Maria had already measured each individual fish's length, weight, shape, routine metabolism, and maximum sustained swim speed. The next trait we're keen on mapping quantitatively to the silverside genome is the number of vertebrae, which we know increases in wild populations from south to north. What will our South/North hybrid F2 generation show? Thanks to Valentina's excellent help, the work went without a hitch. 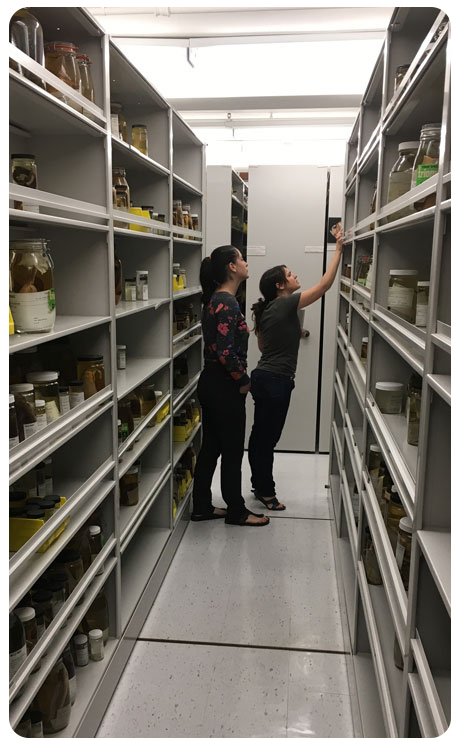 At the end, we even had some spare time to enjoy the great atmosphere int the Lauder Lab during lunchtime, the tour through various lab installations, the experimental fish, and even the adjacent Harvard Zoological museum. Thank you all for the fun day at Harvard! The 282 fish are now split in a DNA sample for extraction and a body sample for further trait measurements. 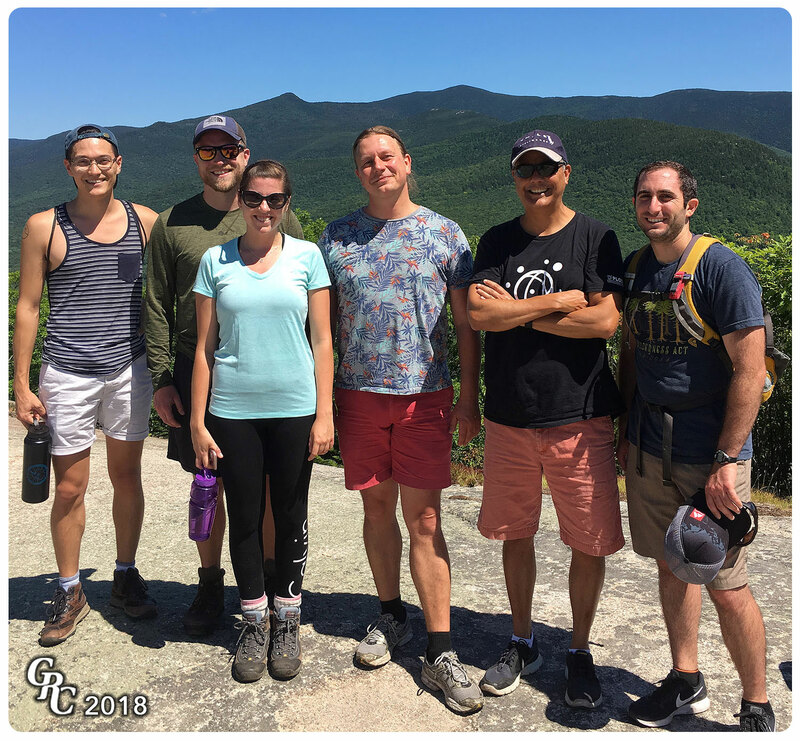 On 18 May 2018, the Baumann lab teemed with activity. 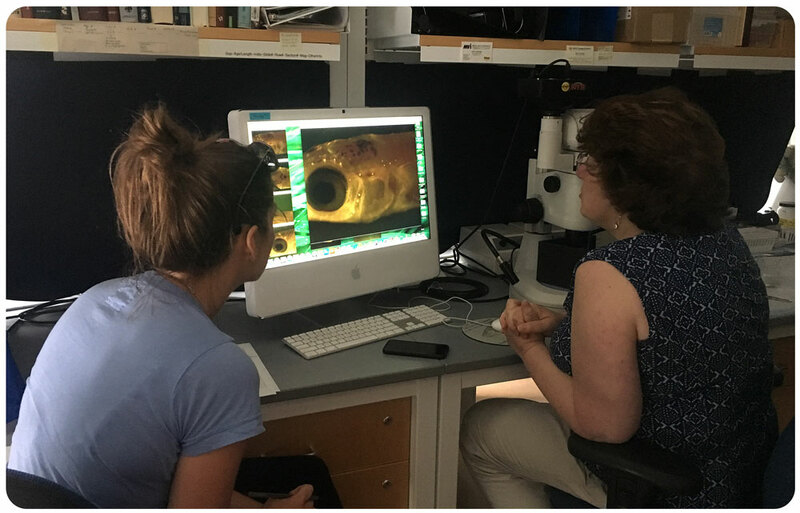 Maria Akopyan from Cornell University was busy phenotyping juvenile silversides for our Menidia Gene project. 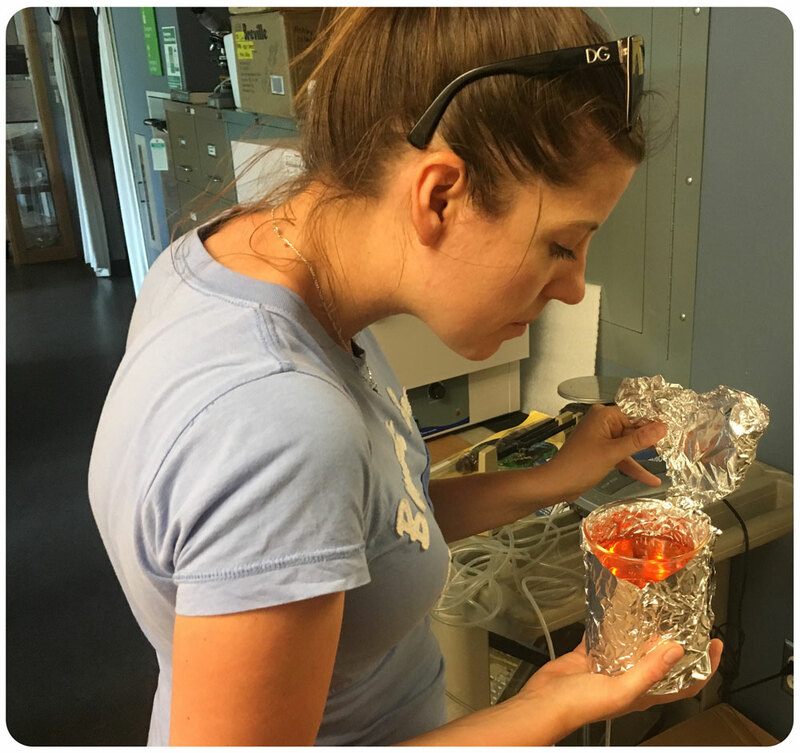 Mia and Mackenzie were busy working up field samples of silversides. And Hannes prepared adult silverside samples for later analyses.